Thanks to the small backwash flowrate, Filtrex designed a solution composed by an automatic ACP filter with a Centrifugal Oil Cleaner directly installed on the backwash line. 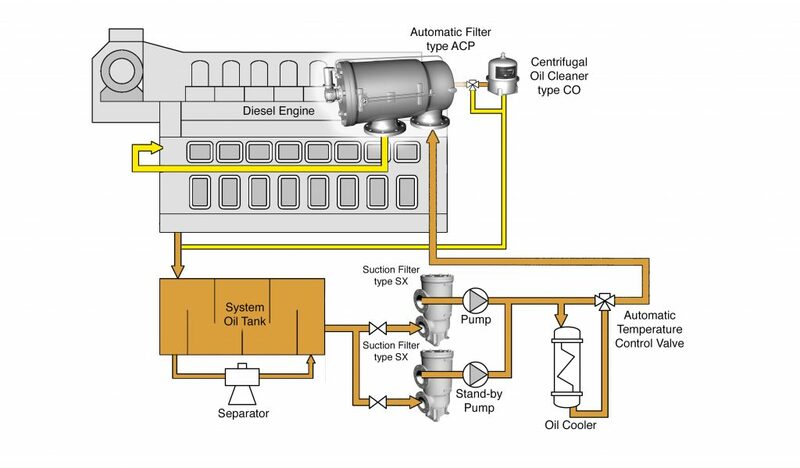 All the impurities retained by the automatic filter are removed during the backwash phase and concentrated in a dirty fluid and delivered, in the conventional solution, to the lube oil tank. In the Filtrex ACP+CO solution, the backwash dirty fluid is directly sent to the Centrifugal Oil Cleaner that definitively cleans the fluid before discharging clean fluid in the lube oil tank. The ACP automatic filter uses less than the 3% of the total flow for the backwashing phase; this 3% is sent to the centrifugal cleaner before returning to the oil tank. 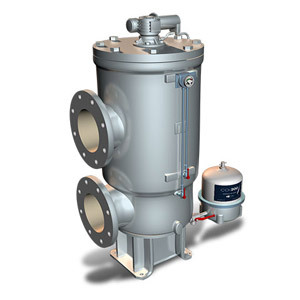 In this way, this small flowrate (3%) contains 100% of impurities removed by the automatic filter. The conventional solution, with the Centrifugal Oil Cleaner downstream the lube oil pumps in parallel to the Automatic Filter, allows to treat the 3% of the flow and only the 3% of the impurities instead of the 100% of impurities as the ACP+CO solution. The Filtrex solution, avoiding accumulation of impurities in the lube oil charge, has shown a remarkable improvement of the oil quality, with considerable benefits to the engine components and to all the lubrication circuit equipment. By simple inspection of the oil cleaner, it is also allowed a very early detection of abnormal impurities reaching the filter (white metal, lints, water, etc.). The ACP + CO is the perfect solution for the retrofit of the existing filters to reduce the spare parts cost and to have a excellent protection of the engine. Based on the several retrofits executed, the ROI starts from 5 months depending on the existing filters installed. In case a Centrifugal Oil Cleaner is already installed downstream the lube oil pumps, the same size of Centrifugal Oil Cleaner can be installed in the ACP backwash line without any additional cost.